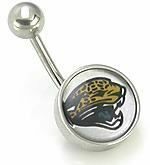 Sport this official NFL navel ring bearing tribute to the mighty Jacksonville Jaguars. This piece is made from 316L stainless steel. Entire ring including charm is 14g 7/16" with internal 1.2mm threading hold the ferocious Jacksonville Jaguar securely in place.